Owner: Massuchusetts Call/Volunteer Firefighters Assoc. Description: The Safety Train U-Boat in West Springfield along with a flanger and other parts of the MCVX train. 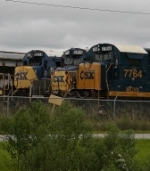 Description: MCVX 7764 sits in CSX's West Springfield Yard. 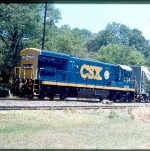 Description: MCVX 7764 sits in CSXs West Springfield Yard. Description: CSX 6222 leads a westbound local past MCVX 7764 and out of the West Springfield Yard. Description: At night in W. Springfield. Description: Former U36B, now a training exhibit for fire and rescue departments. Description: CSX (MCVX) U36B 7764 on Q275 South. 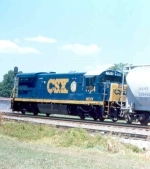 Description: MCVX #7764 and the MCVX Safety Train trail on CSX Q441-16. Description: suns in the yard with the rest of her train used for training fire responders on how to deal with fires onboard trains.